I like that there's finally a way for men to get a condom that actually fits. The "one size fits all" approach at the drugstore--okay, two sizes--does nothing to help those who are below the norm to stay protected. This app is great! dear me what will they think of next? 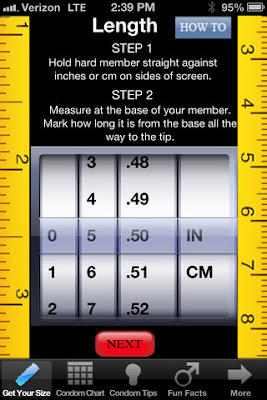 But my 4S is only 4.54" long. How the hell am I supposed to measure anything with that? LimeVPN offers the Buy VPN Service to internet users for accessing blocked torrents, without any hassle.